Did you know that your life is impacted everyday by decisions made in courts? The United States judicial system exists to provide “justice for all” including children and teenagers. Since teens don’t have the same legal rights as adults, what happens when you challenge the system and take an issue to court? Below you will read about several teens who fought for an issue that matters to you — freedom of expression at school. The facts and outcome of their case is presented here. To read more about these teens and others who spent years pursuing their cases through the courts, take a look at “Teens Take It to Court–Young People Who Challenged the Law and Changed Your Life“. Each case ended up in the U.S. Supreme Court who had the final say. You may be surprised or disagree with some of the decisions. U.S. Supreme Court, Washington D.C.
“Teens Take It to Court” covers juveniles taking positions on parental discipline, education, sexual harassment, drug testing, privacy at home and at school, abortion, dress codes, censorship at school, prayer, mental health treatment, divorce [custody and visitation], and the death penalty [which was outlawed in 2005 for anyone under 18]. Do you have complete freedom of expression at school? In June, 2007, the Supreme Court decided the case of Frederick v. Morse. Joseph Frederick was an 18-year-old senior at Juneau-Douglas High School in Alaska. During the Olympic Torch Relay through town in 2002, the students were released from school so they could watch the torch pass by. 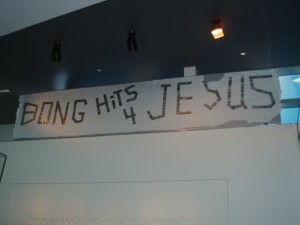 Original poster, Newseum, Washington, D.C.
Joseph stood across the street from the school and displayed a banner that read “Bong Hits 4 Jesus.” The principal, Deborah Morse, confiscated the banner and Joseph was suspended for ten days. He sued the school claiming a violation of his freedom of expression. Joseph lost the case when the Supreme Court ruled that a school can limit student speech that seems to advocate illegal drug use. Its decision was based in part on the 1969 case of Tinker v. Des Moines which set the standard for determining student freedom of speech. The picture above is of the original sign, now hanging in the Newseum in Washington, D.C.
As of January, 2008, Frederick was teaching English in China. In November, 2008 the civil case against the school district was finally settled. Rather than spend more money defending its position, the school district agreed to pay Joseph $45,000.00 in full settlement of all remaining issues. In December, 1965, a group of students and parents in Des Moines, Iowa, decided to express their objection to the war in Vietnam by wearing black armbands during the holiday season. The school district, fearing the protest would create a disruption, passed a policy banning armbands at school. Students who wore one would be asked to remove it. Refusal meant suspension until they returned without it. John Tinker was 15 and in high school. His sister, Mary Beth was 13 and in junior high, while Paul (8) and Hope (11) Tinker attended elementary school. All four kids and a friend, Chris Eckhardt (15) wore the two-inch wide black armbands to school. When John, Mary Beth and Chris refused to take the bands off, they were suspended and sent home. After the holidays they returned to school without them. 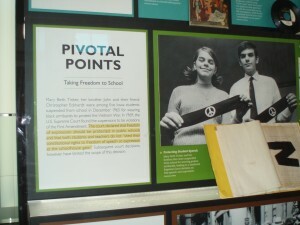 The picture above is Mary Beth, John and the original armband now on display at the Newseum in Washington, D.C. The Tinkers sued the school district asking the court to throw out the armband policy as an unconstitutional violation of their freedom of expression. 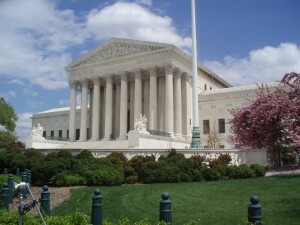 In this case, the Supreme Court needed to balance the authority of school officials to maintain order on campus and the First Amendment rights of students. The Court stated firmly that free speech on campus is the basis of our national strength. “A subject should never be excluded from the classroom merely because it is controversial,” wrote the Court. But does this mean there are no limits–that you can say or do anything while at school? Where is the line drawn? The test is one of disturbance or disorder. As long as the act of expression doesn’t greatly disrupt classwork or school activities, or invade the rights of others, it’s acceptable. There’s no hard-and-fast rule that applies to every situation. Each case presents its own set of circumstances and must be dealt with accordingly. It was decided in Tinker that there was no evidence of disruption at school or interference with other students’ rights. The armbands were a symbolic act–a “silent, passive expression of opinion” unaccompanied by any disorder. In fact, it generated discussion on the subject outside of the classroom. Since Tinker there have been other cases with thorny First Amendment issues. Are you free to express yourself in writing at school? What about on the Internet? Does the school have any authority over what you write on MySpace or Facebook at home? [Take a look at the cases discussed under “You and the Internet“]. Can you be suspended for using profanity at school? Can you circulate a petition at school? Can you be disciplined for wearing T-shirts or buttons with offensive messages–or depicting weapons or drugs?